I remember always fidgeting with game controllers. 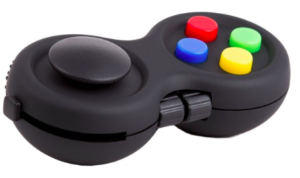 There are so many fidgets on them: from the joystick to the different textured buttons. The Fidget Controller Pad from Special Supplies is a pocket-sized fidget that helps relieve stress in adults and children.